As a boy, my abiding memories are of open fields teaming with butterflies, large hollow oaks where the tawny owl nested and smelly black ponds full of frogs and newts. I was brought up in the North East of England, in a new town surrounded by open farmland and pasture, but it was when my parents moved to the small village of Heighington, that all my dreams were answered. At fourteen, I would awake early before school to roam the fields and conifer plantations in search of sparrow hawk and woodpecker, and watch the cuckoo being fed by a dunnock. I kept an orphan magpie called Mac, which would fly free to feed and return to the aviary at night. On leaving school, I trained in animal anatomy as an apprentice taxidermist, which gave me a greater understanding of the inner workings of bird and mammal. Here, I modelled foxes tongues and painted background scenery to enhance cases of animals and birds. Fascinated by the beauty and variety of fur and feather patterns, I painted in watercolour and acrylics, developing skills and a body of work for my first solo exhibition at nineteen. It was well received, and I left taxidermy to follow a freelance career as a wildlife artist. 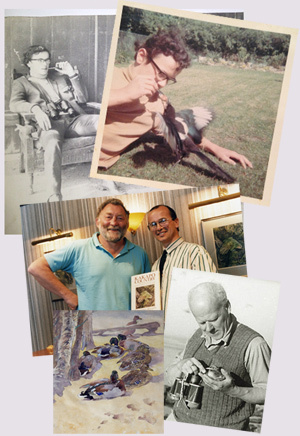 I appeared on TV with eminent botanist Professor David Bellamy who sent me to Madagascar as scientific artist and several years later, spent time in the company of field sketching pioneer, broadcaster and book illustrator Dr Eric Ennion, who greatly influenced my approach to field observation. These experiences fuelled my passion for the natural world and began a life-long study of wildlife and art.